In 1993, The Children’s Partnership was founded as a different kind of children’s advocacy organization. In response to major policy shifts that ignored the needs of children, The Children’s Partnership was created to set a children’s agenda on emerging issues – from technology to healthcare to immigration. This October, we are proud to celebrate our 25th year of being a leading voice for children and your partner in our shared work to support a bright future for every child. During our year-long celebration, we will share reminders of our journey together. We will take a look at past pressing issues and how TCP tackled them to help children thrive over the years. As we reflect on our work, we will also shine a spotlight on current and future challenges impacting children and how TCP plans to evolve and innovate to better serve California’s children and their families. We look forward to spending the next year with you – celebrating the past and taking action for the future. Now, more than ever, we strive to carry out TCP’s equity-driven legacy to protect and enhance the health and wellbeing of all children, no matter their background. Keep an eye out for information about upcoming events and happenings, including our November 7th Happy Hour! Together, we can ensure every child in California has the resources and opportunities they need to thrive. 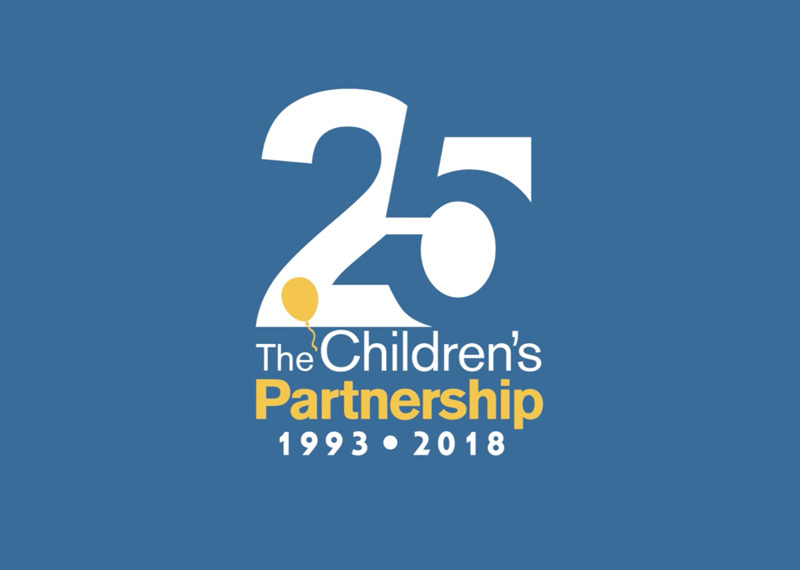 October 9, 2018 – The Children’s Partnership Turns 25! Join us in launching TCP’s 25th Anniversary celebration, a year-long campaign in which we’ll be commemorating 25 years of TCP’s accomplishments in policy and innovation. October 16, 2018 – Kick-Off Giving Tuesday Campaign This year, TCP is kicking off our month-long #GivingTuesday campaign with videos from our interns, Board members, partners, and other friends of TCP sharing how they work to #Give4Kids. November 6, 2018 – Don’t Forget to Vote! Your #VOTE matters! America’s children cannot cast their vote, but they are the ones who have the most to gain or lose from the decisions we, the adults in their lives, make on Election Day. Make your voice heard for kids by downloading our Voter Guide to Improve the Lives of California’s Children. November 7, 2018 – A Happy Hour for California’s Future On the heels of the 2018 midterm elections, come mix and mingle to help TCP continue its work to make every child matter. Join us at Everson Royce Bar where we’ll have light refreshments and drinks available for purchase. November 15, 2018 – Kick-Off Giving Tuesday Campaign This year, TCP is kicking off our month-long #GivingTuesday campaign with videos from our interns, Board members, partners, and other friends of TCP sharing how they work to #Give4Kids. November 27, 2018 – Giving Tuesday #GivingTuesday is a global day of giving that harnesses the collective power of individuals, communities and organizations. Following Thanksgiving, join us in giving back to kids this #GivingTuesday2018. March 8, 2019 – Healthy Mind, Healthy Future: a Symposium to Promote the Mental Health and Well-being of Children in Immigrant Families In collaboration with the California Immigrant Policy Center (CIPC), we’ll be sharing the findings from our research efforts on the negative health effects of immigration enforcement and anti-immigrant rhetoric, alongside recommendations for what you can do to better support the mental health and well-being of children in immigrant families. October 2019, TBD – 25th Anniversary Gala Closing our year-long celebration, TCP will host its first annual signature event with a featured guest and distinguished honoree receiving our Innovator Award. More details to come! Thank you for joining us to support our 25th Anniversary Campaign! Your $25 will help us share our ALL IN materials with nearly 100 families. Your $250 will help us show elected officials in Sacramento the value of implementing telehealth in schools so that children get the care they need when they need it. Your $2,500 will help us produce a new report on what is known as the “chilling effect,” a term used to describe the consequences of federal policies that threaten immigrant communities. Visit our donate page to learn more about other ways to contribute to these and other efforts.